After the Spanish government granted asylum to the abolished Bulgarian monarchy in 1951, King Simeon made Madrid his home. He and each of his five children all married Spanish citizens and the family developed close friendships with the Spanish royal family. It was thus not surprising that the entire Bulgarian royal family attended the marriage of the Princes of Asturias and Letizia Ortiz Rocosolano on May 22, 2004. The Princess of Turnovo, wife of Prince Kardam, topped her blue silk suit with a dramatic headpiece in beige and pale blue and feathers. I want to like this piece but I just can’t shake the image of a sandstorm swirling around Miriam’s head. Combined with her skirt, this outfit has too much ruffle and swirl going on. Sadly, Prince Kardam and the Princess were seriously injured in a car accident in 2008; Miriam recovered but the Prince remains in a coma today. The Princess of Preslav, wife of Prince Kyril, wore a picture hat with a wide, fluted organza brim. The pale pink hat was trimmed in lace and organza leaves, creating an almost ethereal effect around Rosario’s face. The hat was a striking contrast to her tailored coat and the ensemble gave further proof as to why legendary designer Valentino considered Rosario his muse. Prince Kubrat’s wife, the Princess of Panagyurishte, topped her lilac coat dress with a hat from Spanish milliner Candela Cort that defied description. The center of Carla’s hat, a brightly hued floral headpiece, was surrounded in a floating wired brim in lilac organza. This headpiece was reminiscent of Saturn’s ring; while its intended effect might have been celestial, it came off as rather odd. Prince Konstantin-Assen’s wife, the Princess of Vidin, wore a latte coloured straw hat trimmed with long brown and beige feathers. This disk-shaped hat featured a slow rise in the centre but as it stayed clear of pyramid territory, it seemed to work. The jaunty angle that María placed it also showed the hat to beautiful effect. I love the warm colour on her although the feathers do seem a little haphazard. Princess Kalina of Bulgaria is notoriously adventurous when it comes to fashion – her ecru straw hat with orange feather trim was a rather sedate choice (for her, that is). A sedate hat, however, it is not. With a double upturned brim and mass of ecru leaves and orange feathers on the brim, this hat packs a fair bit of visual punch. A decade ago, sharply diagonal ‘slice’ hats had yet to come into royal millinery fashion so this one was certainly ahead of its time. I like it on Kalina… not because it is a particularly beautiful hat but because it is so much more attractive than what she usually wears. I can only assume Princess Margarita and King Simeon were also in attendance but have not located a photograph (any help you can provide would be greatly appreciated). 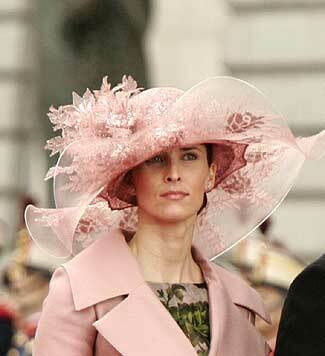 My favourite hat here was the pink confection worn by the Princess of Preslav – which hat stood out here to you? Early tomorrow morning, we will wrap up coverage of this wedding with a look at the hats worn by representatives from the remaining non-reigning royal families.